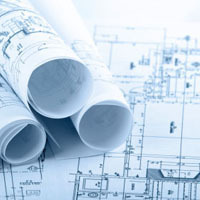 Drawing is an operation by which slivers are blended, doubled or leveled and by drafting reduced to proper sized sliver, suitable of being fed to the spinning frame. 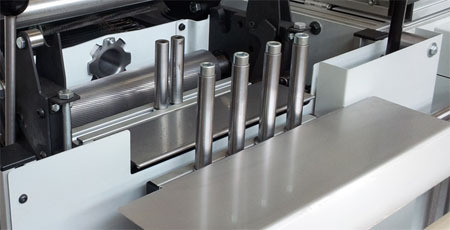 This process considerably influences the final product, as draw is last point of compensation for the elimination of errors produced by subsequent machines. 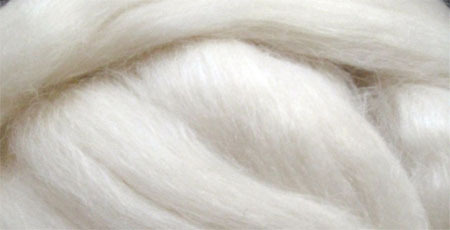 Whereas a drawframe is used in the straightening and parallelizing of cotton and other short fibers, a gill box is used for processing wool and other longer fibers. 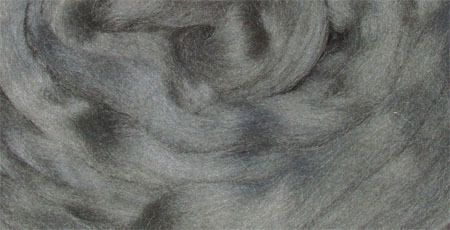 The purpose of the gill box (also called pin drafter) is to mix and align fibre strands with the help of a pin field. 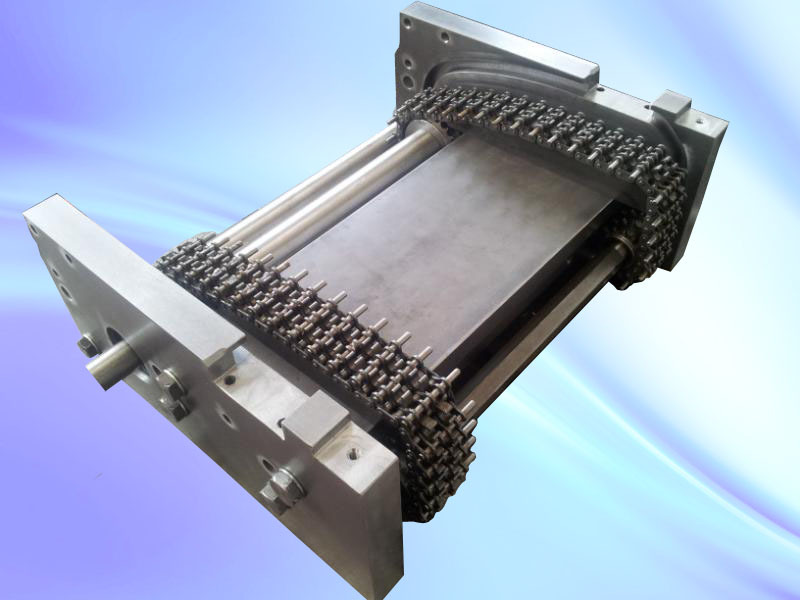 This so-called pin field may be transported by means of a screw drive, chain drive or rotary drive. 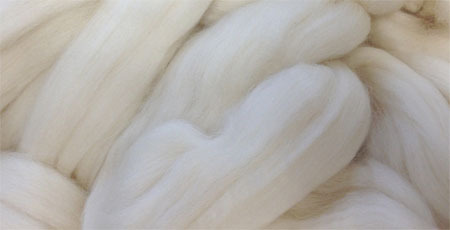 To complete the semi worsted line Ramella offers a chain driven gill box. 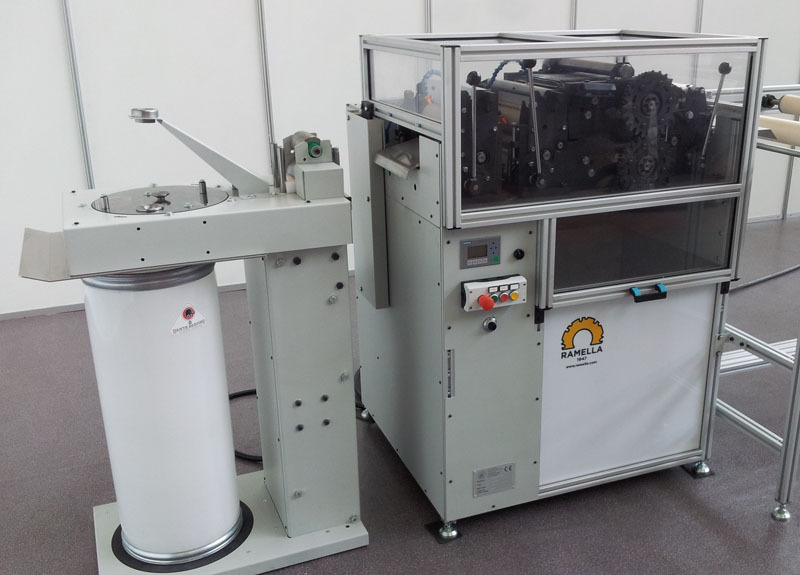 Compared with the screw driven gill box our machinery allows a much higher production (up to 60 m/min - 200 ft/min output speed), very low noise level, lower energy consumption and easier maintenance. 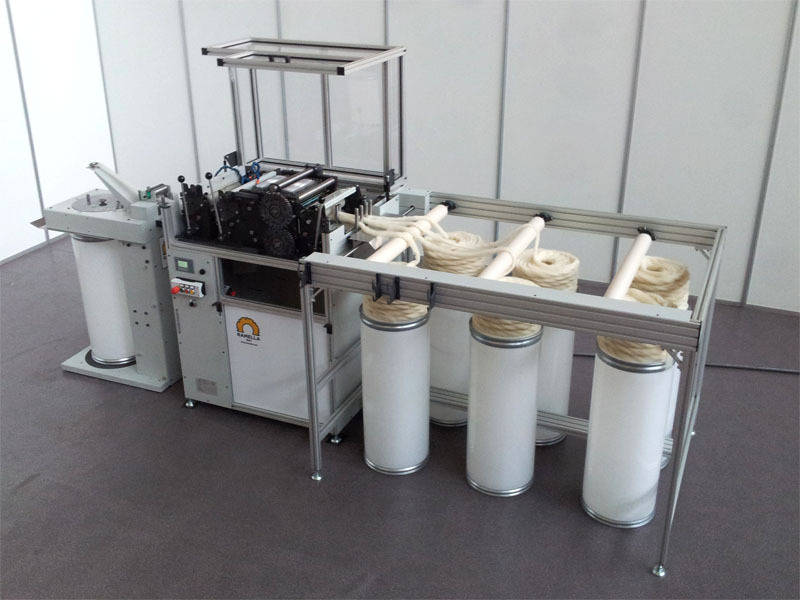 For these reasons in the industry this is the most widely used system to draft long fibres. 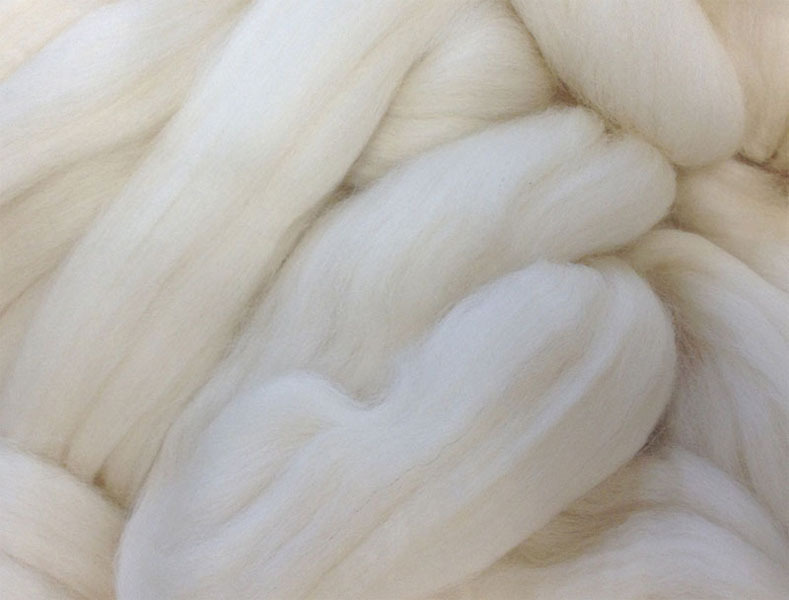 • To increase the straightness and alignment of the fibres. • To improve the evenness and the uniformity of the sliver. • To remove the dust from the sliver. 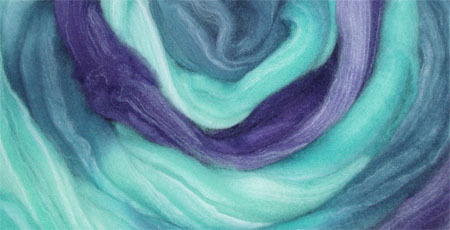 • To make perfect blending of the component. 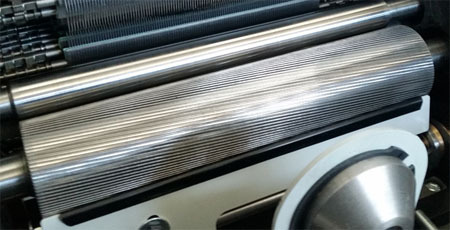 The cans containing the sliver are placed below the creel, rotating rollers facilitate the transfer of slivers from the containers to the entrance of the gill box. 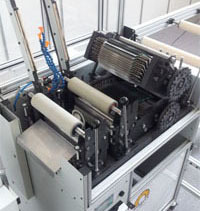 The first roller unit brings together several slivers, drags them evenly and introduces them in the comb head without slippage. 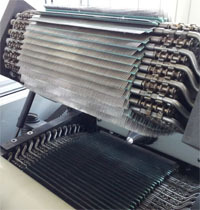 The comb head and the central group of 3 rollers perform the combing of the fibers and drafting of the slivers. 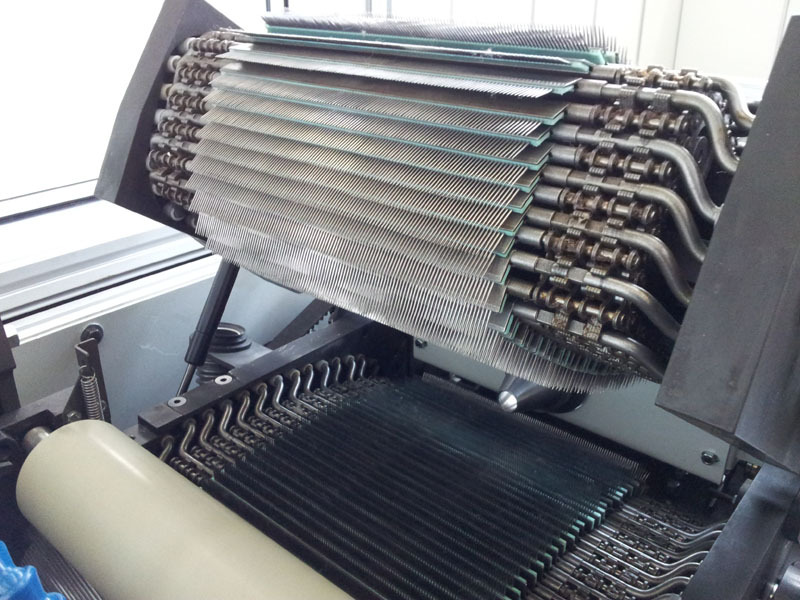 This is the heart of the machine in which the main operation is performed. 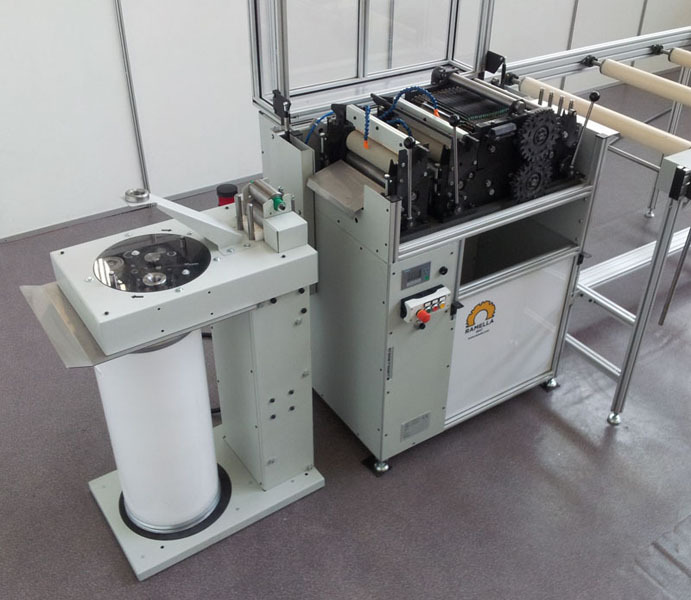 In the final part there is the last roller unit that transports the fibers to the can coiler and to check for any breakage of the sliver. 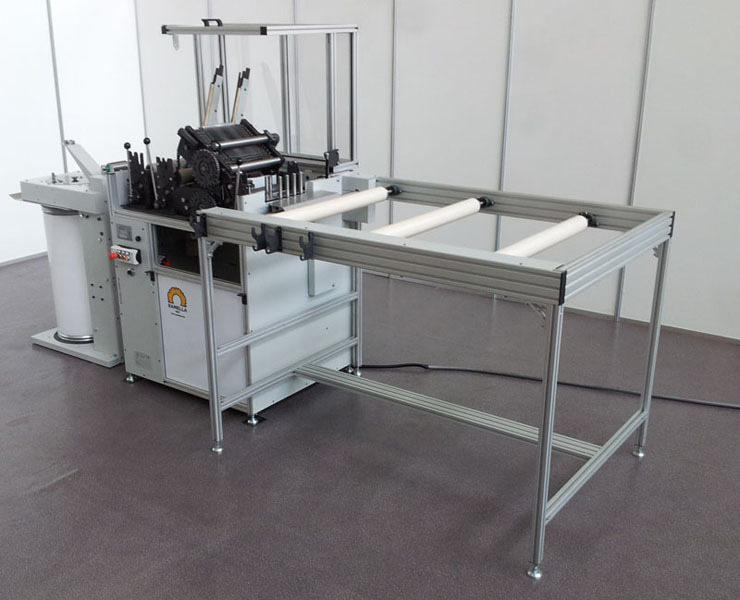 The pin drafter is equipped with two independent motors controlled by inverter so you can vary the draft of fibers quickly and easily. 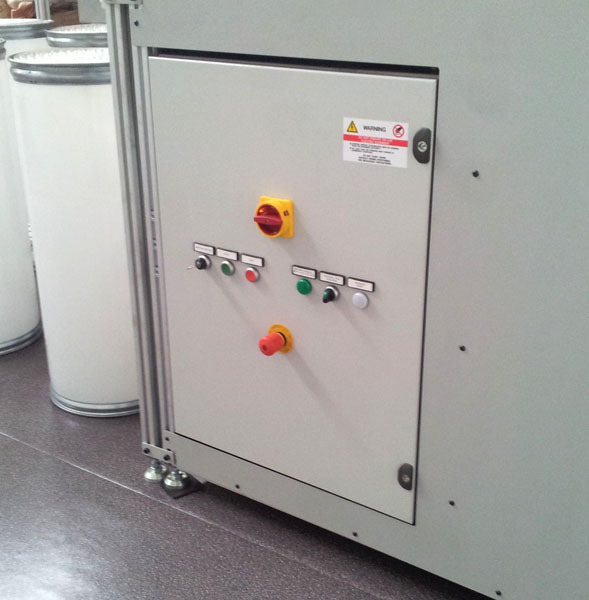 Thanks to the electronic control is not necessary a mechanical intervention on the machine to change the speed of the system but it will be sufficient to act on a digital knob. 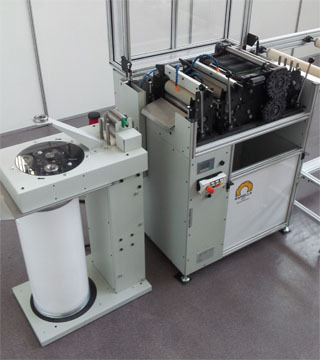 The information are summarized in a front display which allows to quickly set the fibers draft, the output speed of the gill box and the speed of the can coiler. 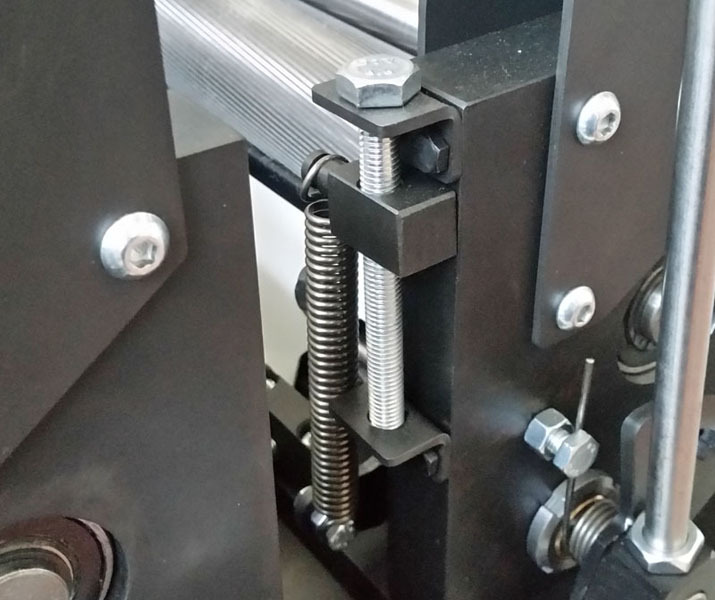 The control system allows you to vary these parameters both during machine standstill both during machine running and takes care of the math needed. 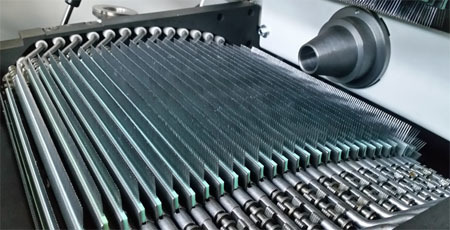 Following industry standards drafting head consists of two units with 72 faller bars each driven by synchronous chains. 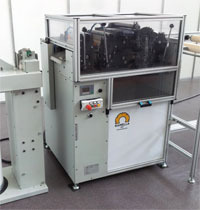 This system allows obtaining a very large pin field (25cm - 10") for a perfect control of the longest fibers. 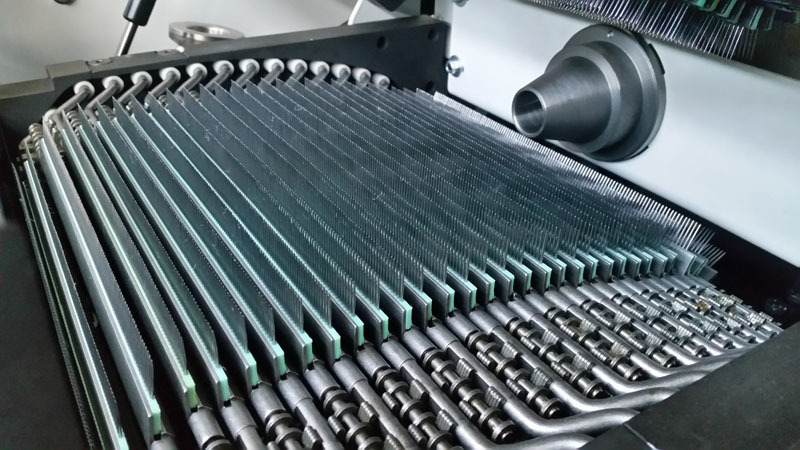 The geometry of the pin field allows for a gradual entry of the combs inside the fibers to minimize breakages and reduce irregularities. 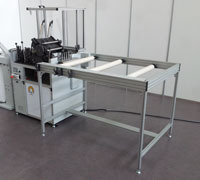 the drafting head structure is entirely made of steel to ensure strength and durability. 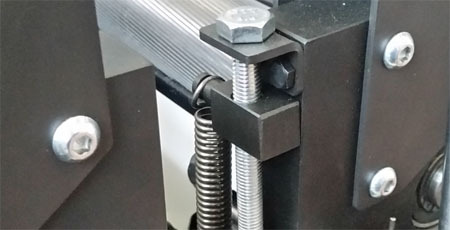 Thanks to the pin strips divided into two parts it is possible to replace the broken tips in a simple and economic way without having to purchase the entire faller bar. This allows a saving of 70% over the full purchase. The pin drafter Ramella is protected by a top cover that provides quick access to the work area. 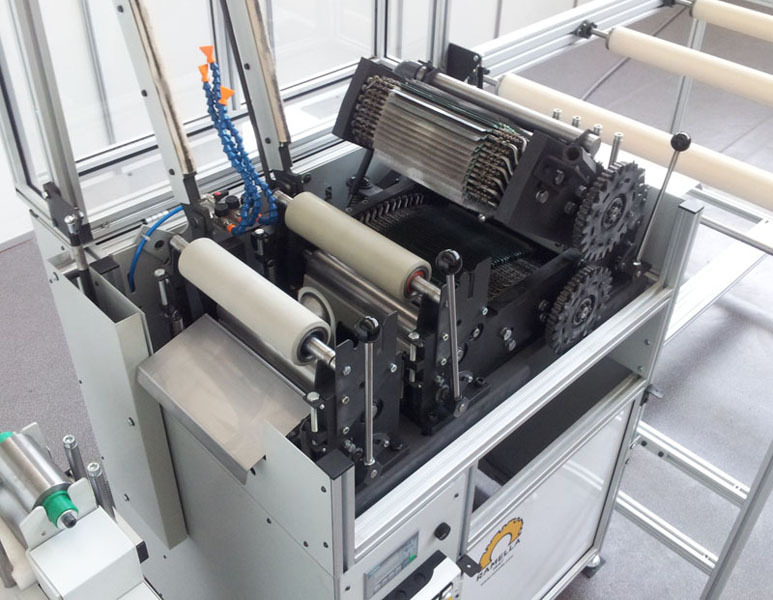 During machine operation a safety switch prevents the lifting of the cover and the transparent polycarbonate windows allow to control at each moment the correct operation of the machine. To further facilitate the operations this protective cover is supported by two air springs that allow the lift with minimal effort. In addition to the upper cover, the gill box Ramella is fully protected by side plates which allow operating in complete safety. The solidity of the structure, attention to detail, quality at an affordable price make the Ramella gill box the ideal tool to regularize and draft the fibers. • A very high speed. • Maximum flexibility with the electronic control of the motors. • Less noise than the screw system. • Greater economy of operation and maintenance. • The possibility of having a chain driven pin field. 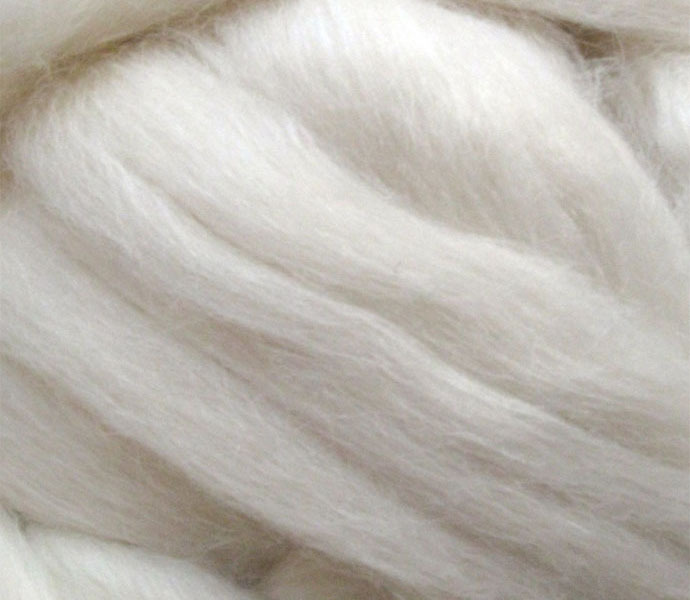 • A driven creel to avoid damaging the slivers. • A solid structure designed to last long. 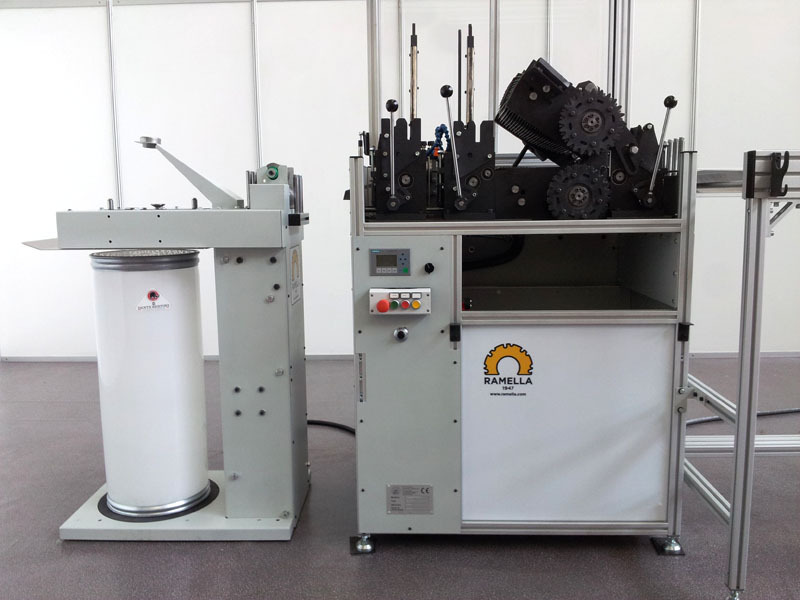 The gill box Ramella is equipped with a driven creel which, in the standard version, allows the positioning of 8 cans. 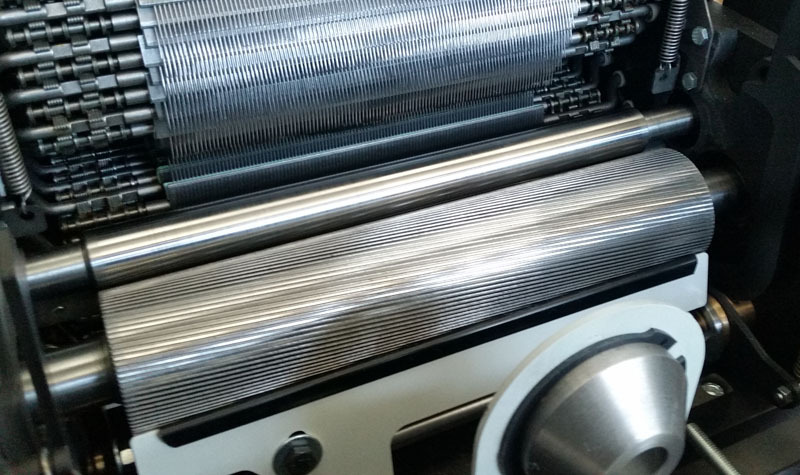 The rotation of the cylinders allows to convey to the central part of the draw frame even the most delicate sliver and, eliminating the friction of the fixed creels, the slivers are not damaged during the transport. The plastic rollers movement is synchronized with the machine and it's safe and quiet. 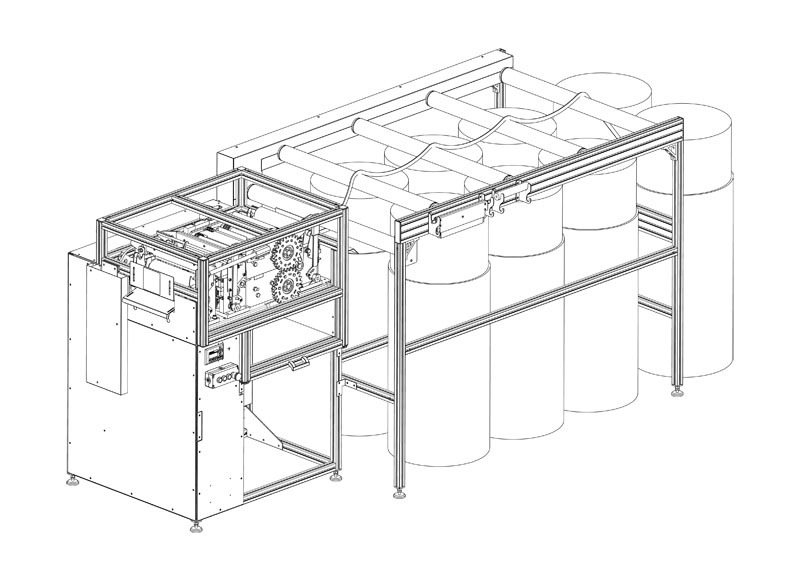 The structure is made of aluminium and can be designed according to the type of cans used. The gill box Ramella is equipped with an electrical panel integrated in to the machine and an handy button panel placed on the front side. 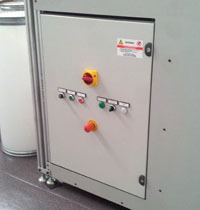 In the front side is also positioned a display, from which it is possible to set all the parameters. 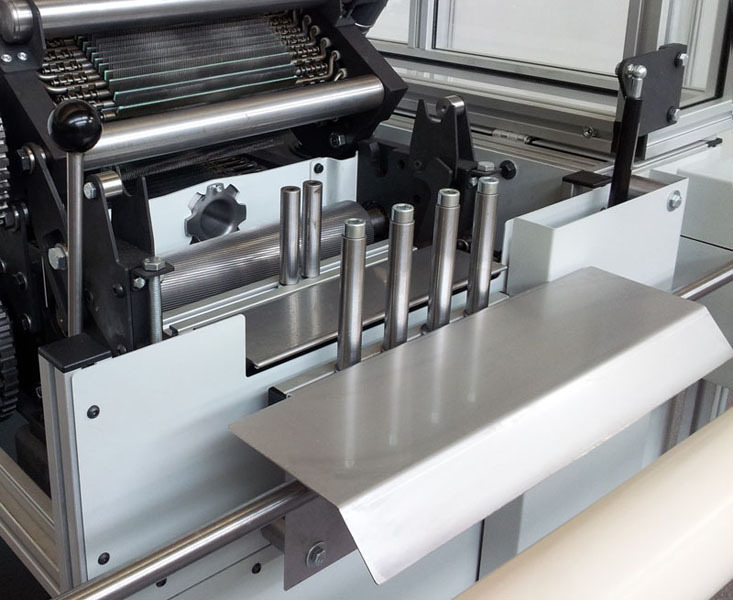 The machine is also equipped with a photocell that checks the presence of the sliver and automatically stops the machine in case of problems. The top cover is protected by an interlock which ensures maximum safety. 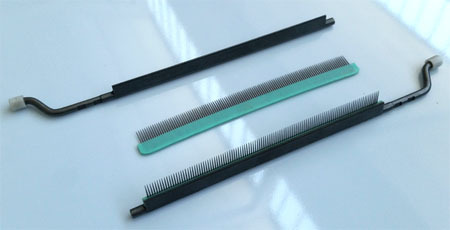 There is finally a suction system keeping clean the comb head. This vacuum cleaner is independent so that it can be placed in a different room to reduce noise. 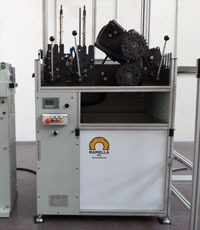 Like other machines manufactured by us our gillbox is characterized by a solid structure designed to last long. 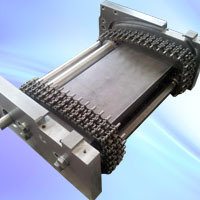 The comb head and roller units are made of machined steel and the surfaces are protected by phosphating. 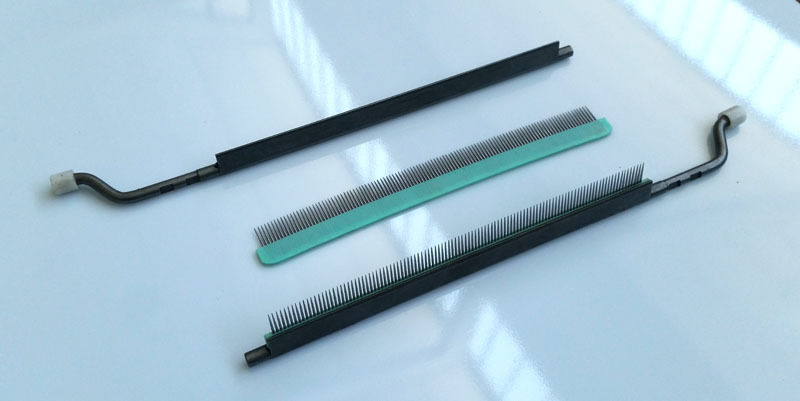 The supporting structure of the draw frame and the creel are made of anodized aluminum and the remaining protective parts are made of powder-coated steel. The functional parts are completely machined so as to ensure the accuracy of the movements.